The phenomenon that is Facebook now has over 1/2 billion users worldwide. There are over 23 million active Facebook users in the UK alone, nearly half the populationand the figures continue to rise. There are also more than 65 million active users currently accessing Facebook through their mobile devices! Yesterday Facebook CEO Mark Zuckerberg announced their new email communication service that ties up IM, email, mobile SMS and social media. In short, intergrating Facebook into even more ways we all communicate with each other. So what does that mean for businesses? Firstly, quite simply it means businesses need to have a social media presence with a Facebook Page at the heart of their online marketing. A Facebook page unlike a static website allows for posts to go viral. For instance, if the average user has 150 friends and ‘likes’ your Facebook Page, all their friends will see the notification on their wall instantly. Furthmore ever time you post an article, link, photo, video or offer to your Facebook Page it will also be on all their walls allowing those people to ‘Like’ your page to. More than half of all Facebook users check their profile everyday so it’s the best way to get your brand in front of them. If someone likes a Page, there is a good chance their friends will too. 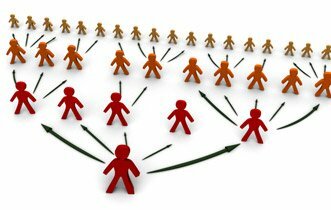 So your Page will multiply with your friends social referals. It’s never been easier to penetrate your target market. Secondly it means your business needs to lead, to stand out from the crowd and the competition. Blend now design and built Facebook Landing Pages and custom tabs. 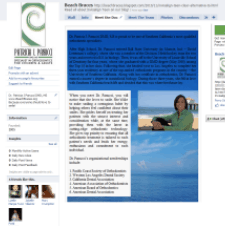 Below – an example of a Facebook Landing Page or click here for the live page. 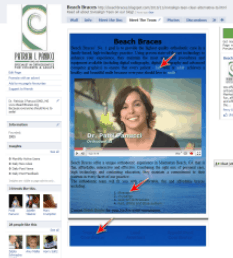 The red arrows indicate hyper-links (allowing customer to navigate to the appropriate page on your website) and at the foot of the page sub-tabs; in this case 3 profiles of the Beach Braces team. Below is an example of a Facebook custom tab or click here to see the live tab. Pages can be designed to complement your wedsite and also include video, photos, opt-in boxes and hyperlinks. A Blend Facebook Landing Page is a one time investment of only £495 with Free HD video. (Value £147) Offer of Free video until 31/12/10. Similar pages on the net are being sold for £928. Feel free to check them out before you contact us. Contact Perry at Blend to secure you customized Facebook Landing Page now on +44(0)207 635 0549 or use the contact button at the top of the page. Buying and Hosting Your Domain Name Is Facebook Working for You ‘Like’ You Know it Should?